The annual Jacob and Gwendolyn Knight Lawrence Lecture will feature distinguished curator Dr. Edmund Barry Gaither. On Thursday, October 24, 2013 at the Jepson Center, Gaither will speak on the topic of visual artists and the great migration. His lecture has two parts: the first half focuses on Jacob Lawrence’s Migration Series which is the most famous visual presentation on the topic. Dr. Gaither has been Director and Curator of the National Center of Afro American Artists (NCAAA) and special consultant at the Museum of Fine Arts in Boston. Dr. Gaither has lectured and published extensively. He has served as curator for eight exhibitions at the Museum of Fine Arts. For the NCAAA, Dr. Gaither developed the museum from a concept to an institution with collections exceeding three thousand objects and a thirty-two year history of exhibitions celebrating the visual arts heritage of black people worldwide. Lawrence is from New Jersey although his parents are from the south. 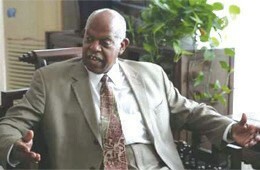 He is a story teller and told the story of Blacks moving from the south to the north. There were many ways that Blacks were constantly moving. Black newspapers were read widely in the south and the urban areas and they provided a day to day account of what was happening during this era. Lawrence was aware of a lot of small and dramatic stories that were the catalyst of moving to the north. There was also the attraction of city life and the entertainment. Lawrence created the migration through his art. He documented this enormous story through art. He does this in serialized murals, small panels and each one tells a story. Lawrence illustrates the story of movement from the south to the north. “The trains are a really big character in the story. It was the way legally and illegally to get from the south to the north. It was affordable, but you also had the hobos who jumped the trains. It also behaved asa2waystreetforpeople both dead and alive”, said Dr. Gaither of Lawrence’s art. “Part of what I try to capture in the lecture is that these experiences were complex and social conditions sometimes unbearable. At the same time there is a sense of home”, said Dr. Gaither. The second half introduce many other artists for whom the Great Migration was a subject. These artists offer different perspectives on how the demographic shift was experienced. “Still other works treat the Migration as the unfolding of a fantastic new opportunity without yet knowing how it would turn out. In my discussion, Dr. Gaither will draw some parallels between the Great Migration in art, and its treatment in literature such as Native Son (Richard Wright) and in music, especially blues. “One of my favorite blue lines is “I‘m going back down South, where the weather suits my clothes, I done stayed here in Chicago, and almost froze.” Hallowing wolf song said Dr. Gaither.